Going the Distance: Interior design student Jihad Peoples is flanked by schoolchildren at Konko Presby Primary School in Ghana. Thumb through Jihad Peoples’ LinkedIn page and you’ll find a list of causes he supports, from civil rights and social action to disaster and humanitarian relief, poverty alleviation and economic empowerment. It’s no surprise the School of Art + Design student opted to spend his spring break half a world away in the Greater Accra Region of Ghana tilling soil, mixing concrete and sweating bullets in 100-degree weather. “Working in that kind of heat was crazy, man,” recalls the Neptune, N.J. native. A few weeks and nearly 5,000 miles removed from “a trip of a lifetime,” Peoples sits at a back corner table inside the Littman Library in Weston Hall, where he studies interior design. Although they’re hidden behind a pair of chic Ray-Ban sunglasses, his eyes light up when he recounts the 10-day stint refurbishing flowerbeds in front of Konko Presby Primary School in Asempanye, a small rural town two hours outside of Accra. “I also learned how to mix concrete with water by hand,” he says, smiling. “The tools they used were primitive. They would throw the dirt in, let it harden up a little bit and turn it over. That’s it. That’s how they did it.” The 70 concrete bricks Peoples made will be used to renovate the school. At NJIT, getting your hands dirty in the name of civic engagement isn’t just encouraged—it’s mandatory. To meet graduation requirements, students in the Honors College must volunteer for 30 hours (15 hours on campus and off campus in Newark). Having been named to the President’s Higher Education Community Service Honor Roll for six years, NJIT boasts a demonstrated commitment to service that inspires students the moment they step foot on campus. 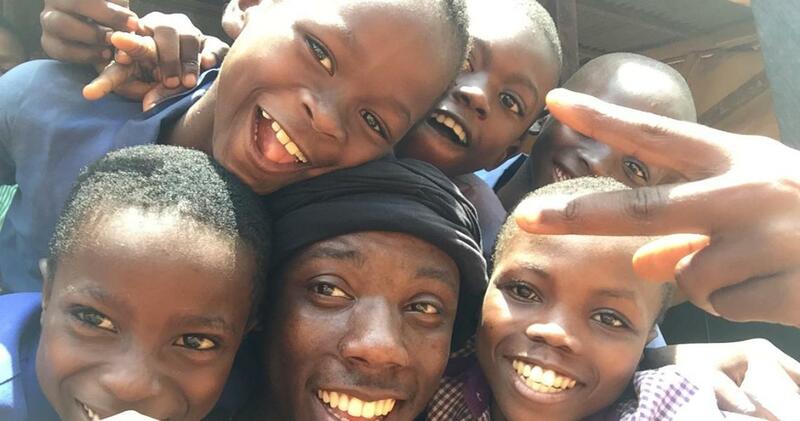 But it isn’t everyday that a Highlander ventures out on his own to raise $6,000 to volunteer in Ghana with International Volunteer HQ (IVHQ), a global travel organization dedicated to improving the lives of others. Peoples made the journey with his bestie and business partner Kyle Lewis, a student at Howard University. Peoples says the trip to Ghana will influence his studies at NJIT and the vision he has for Ladonn, a multipurpose lifestyle brand he and Lewis created to honor the life of their best friend. During a weekend excursion, Peoples and his globe-trotting IVHQ crew traded the dirt roads of Accra for the ocean views in Cape Coast, a serene seaside community with direct ties to one of the most tumultuous eras in history. He takes a beat, visibly shaken by what he saw. So he decides to let his photos do the talking. Walk of Life: A young girl emerges from an alley and cuts down a dirt road in Accra. Small Talk: A group of schoolgirls stop for a quick chat with Peoples on their way home from class. Rest Stop: After carrying a barrel of water on her head, a woman takes a break while waiting for a ride on the side of the road. Daily Grind: Most women in Ghana provide for their families by farming and selling produce. Supply and Demand: A woman purchases a bottle of water to keep cool in the scorching heat. Parts and Labor: Automotive repair and maintenance are a driving source of revenue for Accra. First Encounter: Primary school students in Asempanye meet their new visitors for the first time. Song and Dance: Singing nursery rhymes before class helps the children to forget about any troubles at home, and builds a trusting student-teacher relationship. The Kids Are All Right: Peoples and his new friends converge in front of Konko Presby Primary School in Asempanye, where he constructs flowerbeds (bottom right). “They accepted us like we were a part of their family,” he says. A Brotherhood: Jihad Peoples (right) and his longtime friend and business partner Kyle Lewis outside of the Accra Craft Market, where hundreds of Ghanaians fashion traditional crafts out of wood. Haunting Fortress: The Cape Coast Castle served as the headquarters for transatlantic slave trade in West Africa. On the far left is a church, which sits above the male slave dungeon, where thousands of slaves were held captive. Ray of Light: Inside the male slave dungeon, a small portal served as the only source of light and ventilation for the 1,000 slaves crammed into the tiny chamber. Door of No Return: Slaves were transported from Cape Coast Castle to ships and sent to the Americas. Team Effort: Peoples (third from left) and the International Volunteer HQ group at Kakum National Park before crossing a series of bridges suspended 70 meters above ground.